hard to complain about the smoke when i know there are folks who have lost everything (of a material nature, that is) and there is a whole town in danger!! so, i am not complaining, just reporting. it was clear yesterday when i headed down to high sierra (the quilt shop) – and smokey down there. by the time i returned home, it had blown up here and beyond. can definitely smell it today, altho our property doesn’t look so bad, yet. can see it thru the trees, down the hill on placerville drive. and there is still a breeze up here, so assuming still blowing where the fires are. it is truly tinder dry everywhere in this state, i think. i kind of freaked when i came home to discover tom and candace had run the mower out there! and i didn’t see the hose stretched out and ready!! yes, even running a lawn mower can spark a fire – and what they cut was certainly not green!!! on a lighter note, this is a lovely ‘wild’ poppy i noticed growing in that mound garden. i had planted a wild flower mixture in there earlier this year. only one section made it to flowers as it’s the only section i was able to cover with some wire fencing. no, not from the deer – from the cats! as soon as i had worked up the dirt and planted – well, to them it looked just like a nice fresh litter box! anyway, there’s a dense population of all kinds of little flowers growing in that one patch. we’ll see what survives and returns next year. i saw lupine leaves early on, they didn’t bloom. there’s also some calif. poppy plants i can see which haven’t bloomed. 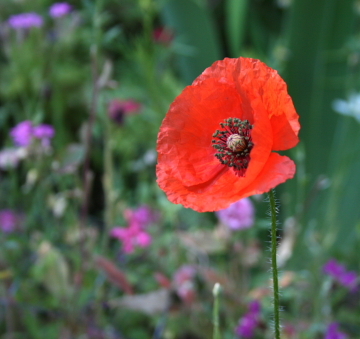 i took this because this kind of poppy is something i am considering doing for a new design. i swear the smoke smell is getting worse even in this short time as i am writing. hmmm, i have clothes on the line. perhaps they won’t smell as fresh as usual!! !